Gas Furnace Repair - Paul's Heating & Air Conditioning Inc. In the middle of a midwestern winter is the last time you want your furnace to break down! Paul's Heating & Air Conditioning can get your house feeling warm again. Cold winters can put a lot of stress on your heating system and there can be many potential causes to a breakdown. Each of our technicians are trained and certified for repairing heating systems. Our technicians are qualified to repair any make and model furnace: Lennox, Trane, Carrier, Armstrong, Guardian, Ruud - you name it, we can repair it. 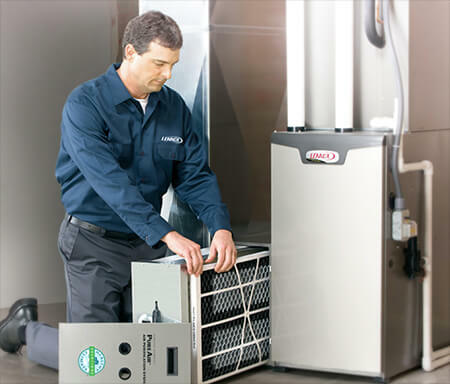 While we do repair all makes and models, we recommend installing high-quality, efficient equipment from Lennox - an industry leader in heating and cooling products. We have been serving the Coulee Region for three generations, with thousands of happy repeat customers who know they can believe in Paul's Heating & Air Conditioning and our quality, professional furnace repair service. The sooner you call us, the sooner we can help. If you know there is a problem, let us know as soon as possible. We have techncians available day and night and we'll be there to diagnose the issue and get your heating system back to working order.